People who make Magazines don't know how to make Websites! You will only read one long blog post in a morning. The rest you will skim through, or you will look for a much more exciting photo-gallery you can click and click and click again. Would you carry the blog you read on your laptop screen under your arm while crossing the street? 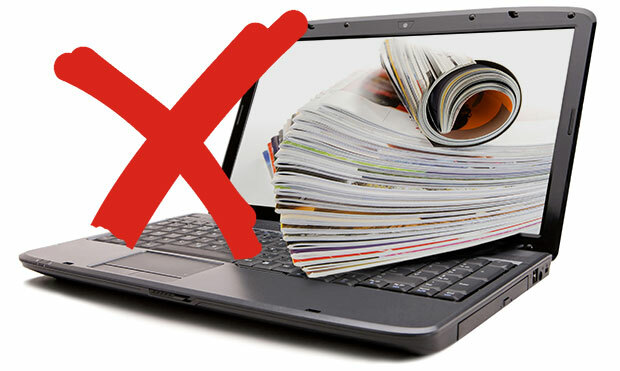 On a web magazine you generally pay for what they get in arrears/in views, while in magazines you buy a piece of a limited market place, not only for the number of printed copies or readers, but also for the brand association..
Paper is about brand as much as the internet is about conversion. Websites are steps on a staircase that lead to product sales. Paper ads are about impregnating images in peopleâ€™s minds and instilling the values that should, eventually, lead to increased sales. It can be a great place to attract more customers, a great place to interact with them at a different level, and a great place in which to promote your brand by creating products that entertain in the web kind of way.